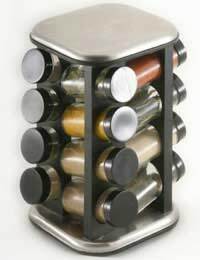 A well-stocked spice rack is a great investment and will really help to elevate your cooking. A pinch of spice or a handful of herbs can lift a dish and it's not just curries that benefit from a healthy dose of spices. Everything from cottage pie to spaghetti Bolognese will benefit from a little spicing up. If you're not a confident cook then you will probably want to stick to established recipes and dishes that you know how to cook. However, if you practise a little and begin to add your own tweaks and touches to recipes, you will probably want to turn to herbs and spices to give your food that extra kick or burst of flavour. It's easy to get carried away when buying spices and you might end up with a cupboard full of jars that have only been used once, if you're not careful. It's far better to pick out maybe four or five spices that you think you'll use a lot. Chilli flakes or chilli powder are great for adding a kick to dishes and obviously you'll need them if you plan on cooking a chilli con carne. Curry powder will be essential for homemade curries, but it's also good for adding a kick to other sauces. Turmeric adds a subtle flavour and great colour to dishes, whilst nutmeg is a must if you're into baking. It really depends on the type of cooking you do, as to which spices you fill your cupboard with but try to be adventurous and add them to a variety of dishes. Just a small pinch can make all the difference. This essential Italian ingredient can be used in sauces, salads and to make your own pesto. A very useful herb that can be added to hundreds of different dishes. This is a lovely, fragrant herb that works particularly well with meat dishes. Great for adding to salads. Use a pair of scissors to snip a few chives from the plant whenever you need them. This will spread and take over your garden if it isn't kept in check. Where would roast lamb be without mint sauce? Try making your own with home-grown herbs.